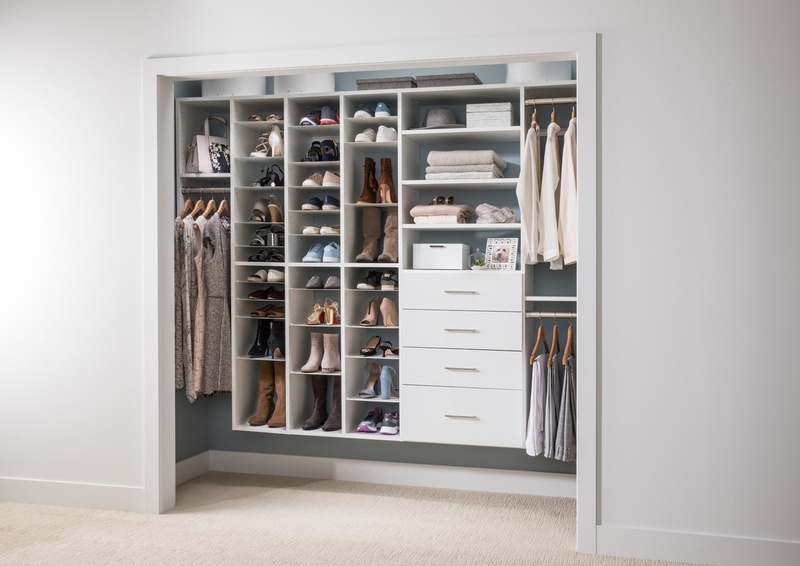 A custom closet system in White combines hanging rods, drawers, and a three tower Adjustable Shoe Organizer to create a pleasing place for all your shoes, accessories, dress clothes and casual wear. The triple shoe tower with steel shelves maximizes vertical storage space for shoes and boots in your closet. Its open design keeps your whole collection visible at once, and adjustable shelves move up or down easily to let you organize, rearrange, and update for each season and each new pair of shoes. If you want to save your project and request a free design review, you will need to create an account. Talk with a designer about your project to receive a personalized design. The design process is interactive, fun, and free. You can skip the signup for now, and get an instant price estimate.